It's the next part of our mission to Please a Reader. 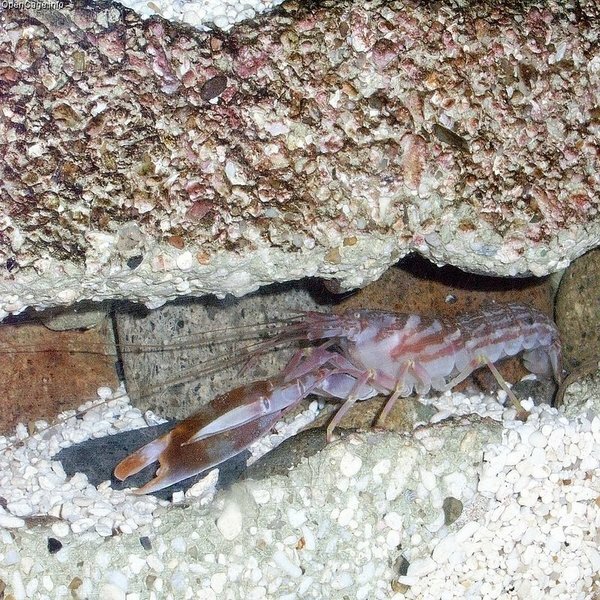 Today we shall meet the Pistol Shrimp which, unlike last time's Mantis Shrimp, really is an actual, proper shrimp. There are 600 species and it turns out they're all tiny, just 3 to 5 centimetres long. 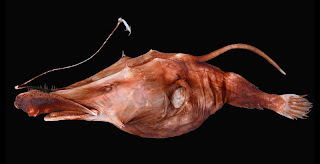 Almost all of them live in tropical to temperate oceans near the coast, although some have found their way to colder seas and some are found only in freshwater caves. There's one thing that really unites them though, and that's their asymmetrical claws. Uh oh. Looks like we're taking a gander at the worst monstrosity of them all, DEATH itself! Almost. We'll focus on clean, shiny and completely ungory skulls to see what we can learn from that which lies beneath the skin and beyond the façade. We're going further than fur, sub-scales and to be honest, I don't actually want to know what they do with the flesh. Luckily, that doesn't matter because all that work is already done. We just have to take a look. Let's do that, shall we? Do you remember the Snake Mackerel? They were predatory fish that prey on, amongst other things, fish. 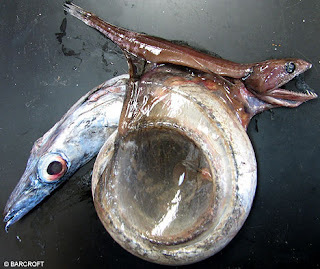 So how did a great, big, 86 cm (34 in) long specimen get eaten by a little, 19 cm (7.4 in) long fish!? It was 4 times its size! It even looks a little embarrassed. Last week we learned all about the Silverfish. 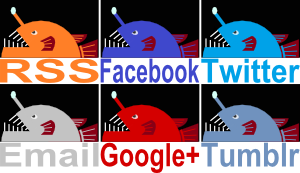 Today we look at another creepy-crawly that sometimes gets called a silverfish even though it's not silver, is in no way fishy and is just completely different in general. In fact, calling this little monster a silverfish would be deeply insulting to the both of them. Why? Because this is the House Centipede, a predatory myriapod which eats, amongst other things, silverfish. I think some sensitivity to the plight of the poor old silverfish is in order, no? Our Dear Reader, Crunchy, has asked us to hurry up and get onto the Mantis Shrimp. Keen to please, what can I do but oblige? As it turns out, while I'd known about their extraordinary superpower, the Mantis Mega-punch, which can enable escape from aquariums by simply smashing it to pieces (probably a lamentable escape because they are entirely marine and very few aquariums are kept in the ocean), they are much more diverse than I had realised and come with another power that isn't quite as brutal but is no less impressive for that. I have just written a 71 word sentence. Do hyphens make 2 words into 1 word? Let's move on. As soon as I learnt about hornbills I immediately thought of them as the toucan's ugly brother. They just look like great, big toucans gone wrong. In fact, it's only now that I'm realising just how wrong some of these guys actually are. 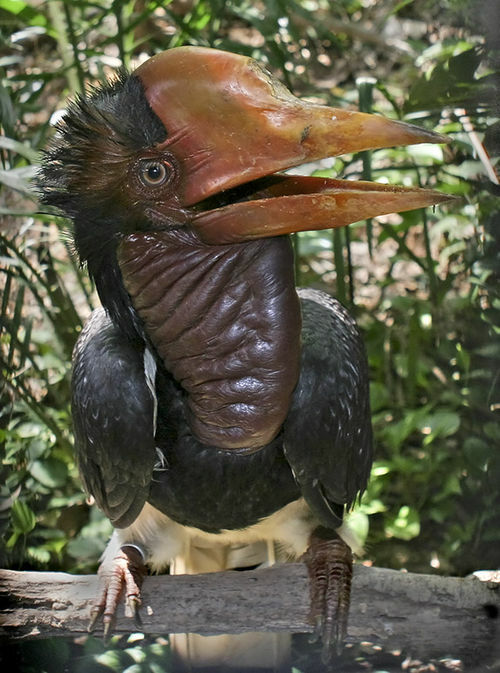 I had no idea as to the true extent of hornbill ugly! This is, of course, great news. 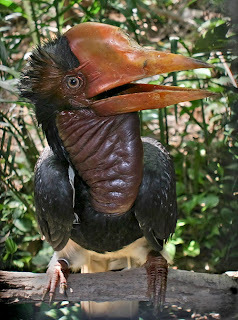 Thus, we shall welcome today the first Really Monstrous hornbill, the Helmeted Hornbill. There are 2 basic kinds of Wolftrap Anglers, each with their own genus. They are Lasiognathus and Thaumatichthys. One thing they share, and which gives them their name, is their extraordinary mouths. The lower jaw is quite short, with short teeth. This is all relative of course. Anglerfish are famed for their massive maws and these lower jaws are by no means short, it's just that the upper jaw is utterly shocking. It's significantly longer and wider, with these kind of "lips" that can close down around the lower jaw. They aren't lips, they're called premaxillaries. There's bone in there, and the edges are lined with long, curved or even hooked teeth. It's akin to our very own Venus Flytrap... Venus Wolftrap, perhaps. It's like their upper jaw has it's own downward facing jaws. Ick. The Megamouth Shark is a big, ugly and extremely rare deep sea shark. Say goodbye to the deadly, streamlined, elegance of so many surface dwelling kin, welcome instead a chunky, flabby, massively mouthed monstrosity that appears to have been carved from flabby stone by a flabby sculptor who just stopped before putting any of the detail in. I couldn't blame him too much though, this thing reaches 5.5 metres (18 ft) in length with reported weights up to 1,215 kilograms (2,680 lb). Maybe he should have started on something smaller? 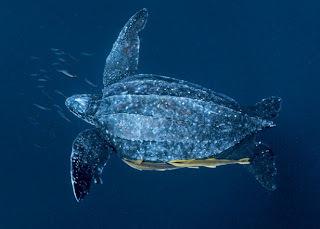 The Leatherback Turtle is a large and unique sea turtle full to brim with all sorts of interesting characteristics, some of which are unseen in other turtles or even all other reptiles. Hang on, did I say "large"? I should say huge or gigantic or some such thing. 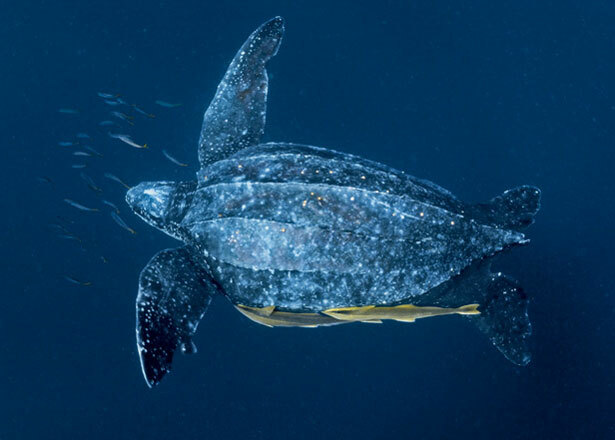 Leatherbacks are the biggest turtles in the world today, averaging out at 1 or 2 metres (3.3–6.6 ft) long with a weight of 250 to 700 kilograms (550-1,500 lb). 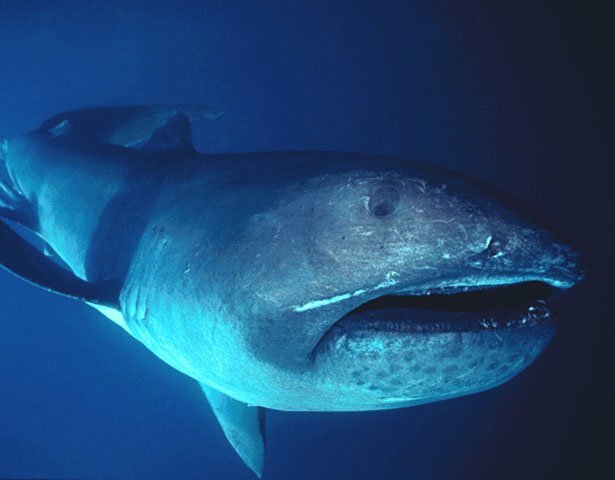 One particularly big individual found on a beach in Wales was 3 metres (10 ft) long and weighed 916 kilograms (2,019 lb). It makes me wonder if these giants have underwater wrestling rings down there. So you take Disney's cute, blue eyed, supernatural, flying elephant Dumbo, tear off his legs and tail, turn his trunk into 8 tentacles and throw him a few thousand feet into the darkness of the deep sea. Now, I know what you're thinking and I agree that Dumbo looks like the kind of guy who would be afraid of the dark, so it's a tad cruel. 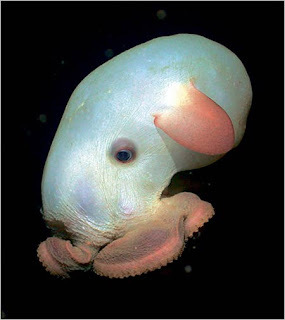 However, needs must and I really, really want a Dumbo Octopus.